I am always a sucker for an adorable holiday romance story. I don’t celebrate Christmas myself, but I just love the idea of characters kissing under the mistletoe and catching snowflakes with their tongues. 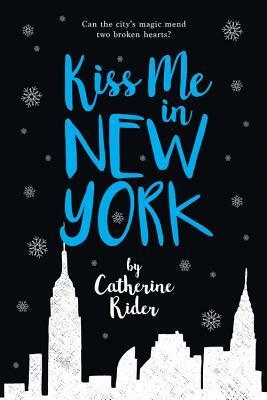 I also adore reading about the Big Apple, so put two and two together, and here you have Catherine Rider’s Kiss Me in New York! I have to admit that this book does not have the world’s most original storyline or characters, but that’s okay with me. It was a short, fast-paced read that did nothing but make me happy and prepare me for winter, and that is exactly what I look for in my contemporaries. Kiss Me in New York follows the footsteps of a girl named Charlotte over the course of one Christmas Eve in New York City, where she has spent the last semester miserably studying. Her plans to fly home to the UK in time for Christmas are shattered when her flight is delayed because of a blizzard, and to add on to that, her boyfriend from college had just dumped her. Enter Anthony. He too has just been dumped in the middle of the airport, so when he and Charlotte meet, they decide to get over their exes together with the aid of a special book to help people do just that. It works miraculously- to the point when they’ve become interested in each other. Neither character stood out very much to me, so what I want to touch on more is the romance between them. It was adorable (that is probably an understatement), yet at the same time unrealistic. I mean, I know next to nothing about these things, but who would break up with their partner and get over them in a night using a book and then find a new fleeting romance within 12 hours? Definitely not me, but given Charlotte’s circumstances, I thought it was fine. Again, the purpose of this book is to make you smile and get you into the holiday spirit, and I’m thankful that this romance novel made me do just that. I have read a fair share of books about fleeting romances. Kisses on a Paper Airplane, The Sun is Also a Star, The Statistical Probability of Love at First Sight, you name it. After a while I probably won’t remember this one as well as some of the others, but what I will remember are the giddy emotions that its premise and setting gave me. If a book like this is able to make me FEEL something, then to me that is a wonderful read. To sum it all up, Kiss Me in New York is not meant to be the most unique, mind-blowing story out there, but a feel-good novel that makes you want to explore the Big Apple and all of its quirks during the festive winter season. In my opinion it’s not worthy of 5 stars, and probably not even 4, but if you want to check out a nice, breezy book to pump you up for wintertime, then this one is for sure worth a read.